Conservation is critical to both the environment and the people of Mississippi, farmers in particular. MSU scientists are working alongside farmers to develop better ways to irrigate. The Mississippi River Valley alluvial aquifer, the Mississippi Delta’s main source of irrigation, is losing 300,000 acre feet per year. Conservation is critical to both the environment and the people of Mississippi, farmers in particular. MSU scientists are working alongside farmers to develop better ways to irrigate. This research will decrease water usage, improve water quality, and increase agricultural productivity, profitability, and yield. While three types of irrigation systems are common throughout the U.S., Mississippi farmers tend to employ either furrow or center pivot irrigation. The third type, subsurface drip irrigation, has not yet proved cost effective for farmers in the mid-South. Much of the state’s irrigation occurs in the Delta, where approximately 70% of land is furrow irrigated. The preferred irrigation method in the hills in northeast Mississippi is center pivot irrigation. Since farmers have tasked MSU scientists to help make them better furrow irrigators, most research is dedicated to furrow irrigation of row crops like soybeans and corn. Some of the research can be applied to center pivot irrigation as well. MSU scientists research essential tools and best practices to improve irrigation in the field. Additionally, the university engages in two dynamic research programs that cut down on the quantity of water used in irrigation while improving water quality overall. Scientists are also looking ahead at research opportunities involving intermittent flooding, polyacrylamide gel, and surface water. Jason Krutz, MAFES researcher and extension irrigation specialist, recommends three essential tools, Pipe Hole and Universal Crown Evaluation Tool or PHAUCET, surge valves, and soil moisture sensors, to help farmers greatly reduce their water consumption. “If farmers adopt these three simple tools, the impact will be tremendous,” Krutz said. “It will reduce water consumption by 50 percent, impacting not only Mississippi, but the entire mid-south.” The cost to adopt these tools is minimal compared to potential water and fuel savings. Pipe Hole and Universal Crown Evaluation Tool or PHAUCET, is a computerized program which calculates the correct hole size and distribution for poly pipe to furrow irrigate row crops. It takes into account a well’s flow-rate, poly pipe length, and field dimensions and elevation. “The program reduces water, fuel, and irrigation usage 20 percent in regular fields and up to 50 percent in irregular shaped fields,” Krutz said. While the cost of the program is free, many farmers opt to hire a consultant. “Having a consultant install the program will cost between $6 and $9 per acre the first year.” Krutz said. “Average annual savings is $10 per acre, per year. While a farmer only nets a little the first year, savings in subsequent years make the initial investment worthwhile.” Researchers are working on a more user-friendly version of PHAUCET, set to be released in 2015. Surge valves split the distribution of water in the field. As an example, a conventional system typically has one poly pipe running down a 40-acre field. The surge valve splits that 40-acre field into two 20-acre fields. A computer-driven butterfly valve in the center of the pipe allows for the intermittent distribution of water, which automatically toggles between each side of the field. The system repeats incrementally in intervals and a single pulse is administered at the end of the cycle until the proper amount of water has been administered. The initial investment is $2800 with a life expectancy of 20 years and battery replacement required approximately every three years. The valve can be disconnected and applied to other irrigation sets to help distribute capital cost over more acres. Soil moisture sensors, which are placed at 6, 12, 24, and 36 inches, determine the amount of moisture in the soil profile. Farmers can spot-check a field and confirm the data being received by sensors. If there is plenty of water, farmers may be able to eliminate an irrigation. On the other hand, if there is soil compaction or surface ceiling, farmers are made aware of the problem long before any yield is lost. Researchers also combine sensor data with plant physiology information to determine optimum irrigation termination based on moisture and plant maturity. Sensor packages range from $200 to a few thousand dollars depending on model type. Sensors, which can access data manually, at the edge of the field, or via desktop, can pay for themselves in a year by eliminating at least one irrigation. 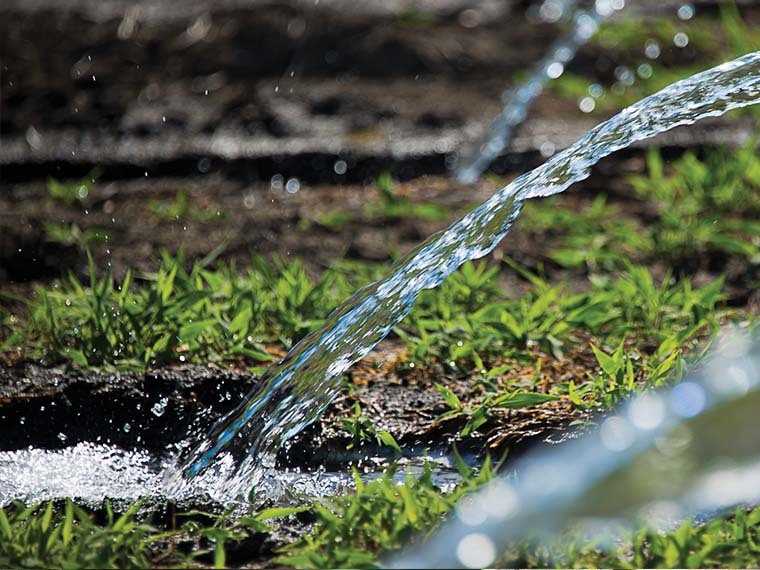 In many cases, an irrigation scheduling tool, such as the Mississippi Irrigation Scheduling Tool, or MIST, can add up to additional water savings. MSU researchers have evaluated scheduling tools that employ the checkbook approach. This approach is similar to entering credits and debits in a checkbook. Computerized or manual scheduling tools measure atmospheric data, crop coefficient, and crop growth stage to track water usage and calculate water budgets. Atmospheric data include solar radiation, wind speed, relative humidity, and temperature. The tool determines evapotranspiration data, which shows how much water the plant used and how much water evaporated. The Mississippi Irrigation Scheduling Tool is a computer program and an atmometer is a manual tool. MSU researchers found that the use of a scientific irrigation scheduling tool can reduce irrigation usage by 30 to 40 percent. Two MSU projects, Row-crop Irrigation Science and Extension Research, or RISER, and Research and Education to Advance Conservation and Habitat, or REACH, are focused on water conservation. RISER helps farmers reduce water quantity while REACH helps farmers improve water quality. 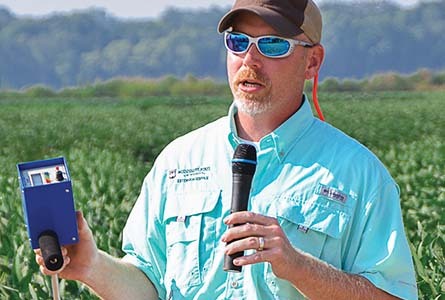 In RISER, MSU scientists partner with corn, cotton, soybean, and rice producers using existing on-farm management systems to promote good irrigation management practices. 17 producers participated in 2013. In each case, scientists worked a 40-acre field and the farmer worked a 40-acre field. The scientists used tools to determine irrigation and the farmer employed his traditional process. The results showed tremendous water and fuel savings. REACH has evaluated how weirs, slotted pipes, and vegetation drainage ditches contribute to overall watershed nutrient reductions. Through the REACH program, MSU scientists introduce innovative management practices for water use to producers as a way for them to save money and still maintain yields. The program works by helping landowners address a water management problem, and then these producers tell others about the benefits and savings they experience with the new management techniques. REACH’s goal is to create a network of cooperative farms with different types of agricultural practices that will showcase conservation practices, how well they work for agriculture and the environment, and serve as models for sustainable methods. Conservation-minded Mississippi farmers have enrolled 126,470 acres in the program. While 90 percent of farmers polled believed they were already efficient irrigators, specific MSU research initiatives have helped early adopters drastically diminish water usage and fuel cost. As these MSU-led advancements reflect the university’s research priority to develop plant production systems that optimize yield, energy efficiency, profitability, and environmental stewardship, it is evident MSU irrigation research benefits farmers, the community and the environment in Mississippi, and beyond.